Encompassing the body of Pauline theology, Ephesians (volumes 34 and 34A of the acclaimed Anchor Bible Series) has been called "the crown of St. Paul's writings," yet both its authorship and addressees are the subject of continuing dispute. Through line-by-line examination of its vocabulary, its difficult style, its Qumran and Gnostic affinities, its parallels with and distinctions from the undisputed Pauline corpus, its use of the Old Testament, and its dialogue with orthodox and heretical Judaism, Markus Barth demonstrates that Paul was almost certainly the author. And, after exploring previous explications of this hymnic and admonitory epistle in detail, he concludes that it was intended for Gentile Christians converted after Paul's visits to Ephesus. On this basis, Barth reexamines the relationship between Israel and the church, discounting the thesis that Ephesians suggests an "early Catholic," or high-ecclesiastic or sacramental doctrine. Instead, he finds in this letter a statement of the social reconciliation which conditions the salvation of the individual. And reevaluating the section describing the relation between husband and wife, he offers an alternative to the traditional notion that Paul degrades women or belittles their rights and their dignity. 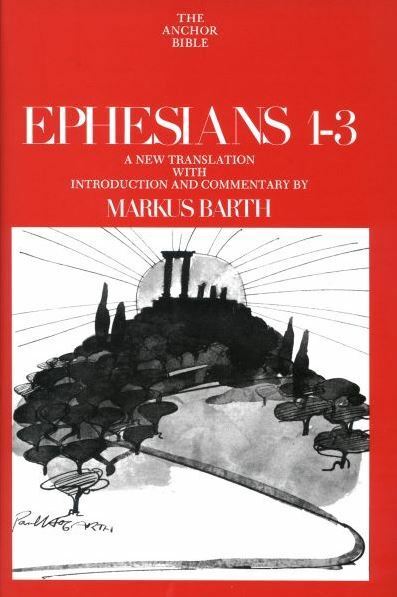 In these two volumes Barth has followed the structure of Ephesians: upon the praise of God (chapters 1-3) are based the admonitions (chapters 4-6). But just as the epistle is an integral whole, so is the author's commentary. Through his special understanding and love of the apostle Paul, Markus Barth reopens to modern man the ancient message of love, worship and joy. Anchor Yale Bible Commentary New Testament Set (26 volumes). Anchor Yale Bible Commentary Set (86 volumes).